Samir Nazareth treats us to his personal brand of humour as he takes us along for the ride through his travelogue, journeying across various states of India. 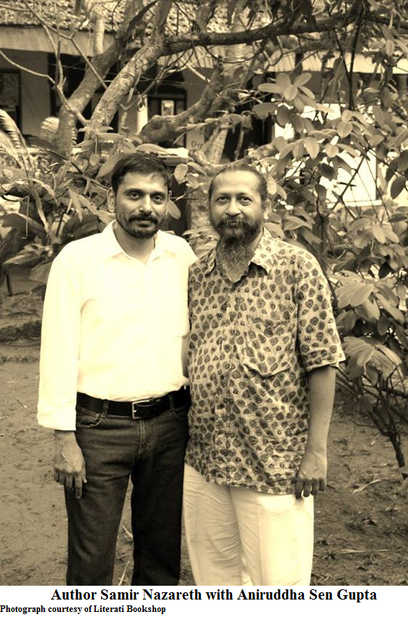 In conversation with Aniruddha Sengupta at the Literati Bookshop, Calangute, he revealed the inspiration behind his decision to traverse the Indian coastline from Gujarat to Sikkim and pen down his experiences in 1400 Bananas, 76 Towns and 1 Million People. The book explores people, how perspectives change when we witness alternative cultures first-hand and history and its implications in the present times. Sloughing off the responsibilities of a regular pencil pusher, Samir decided to take off on what he believed would be a redeeming experience and enable him to live out a dream that had enthralled him since his days as a postgraduate student. Back then it was a dream to escape his scholastic endeavours, but the lack of a bank balance did much to dampen his enthusiasm. In his mature years, the impetus was transmuted into the desire to tour small town India, mingle and converse with the people and savour different cuisines. ‘The good thing about food is that I’m very secular. Anything is welcome on my plate,’ says Samir, who did not have much trouble with his diet. As he had grown up in the south, he opted for places he had never visited before and this allowed him to be adventurous in his eating habits. Language posed a problem. At one point, at a particular town, he decided not to speak to anyone. Not being able to converse easily may have made the trip a lonesome one on occasion, but the challenge presented by the impediment made communication interesting and fun in resorting to means other than words and sounds. Samir discovered the people he came across on his expedition to be welcoming and open towards him. The presence of food items like pizzas, hamburgers and Chinese dishes making their way to these small towns, only altered to suit their taste, displays a desire for integration, having new experiences and economic growth. In terms of an unpleasant happening, Samir recalls an incident where he was put up in one of the few rooms at a hall in Bheemunipatnam (Andhra Pradesh). At midnight, he was rudely awakened by attempts to open the door to his room, accompanied by loud knocks and calls. Confused and fearing the worst, he adamantly refused to budge. Later he realised that the man who had tried to wake him up so vigorously had done it to get Samir to switch off the light in the hall. Therefore, the disagreeable occurrence turned out to be merely a misunderstanding. Samir says, ‘I kept a diary making short notes, thinking I would go back home, grow old and look back and say, “Wow, Samir you did this!”.’ Midway through his journey he realised that his experiences were good material for a book. On returning home and undergoing a process of recuperating from the rigours of his trip, he began writing the first draft of his travelogue. There were regrets of not having made more of the journey than he did, as that would have added to the book. Nonetheless, the six months of writing were a time spent in a pleasurable venture as Samir loves to write. The prospect of going back to the places visited after all these years, to make a comparison of the changes brought about by time, has some amount of appeal. At the same time, Samir would like to see new places as well. The hardships of a second tour of six months, such as the one he undertook in 2005, tend to colour his enthusiasm a shade of yellow in deference to a more comfortable existence in his present state. 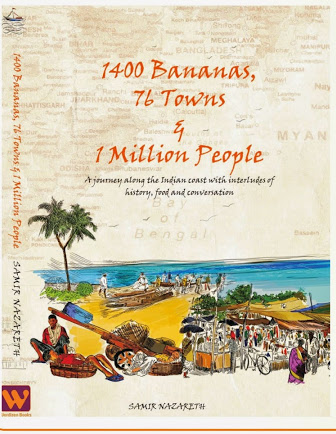 Whether there will be a sequel to 1400 Bananas, 76 Towns and 1 Million People rests largely on Samir’s motivation to pick up the trail where he left off.